«White Square» advertising festival: deadline is coming! Regardless the fact, that the deadline in only on April 7, it’s better to hurry up and that is why. 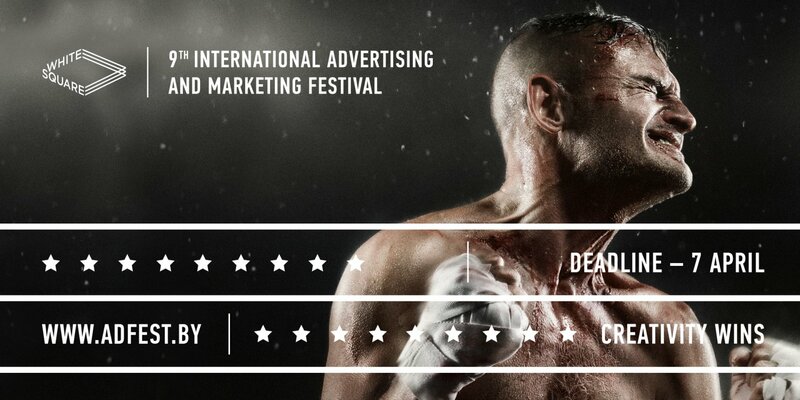 First of all, White Square is a tournament of advertising talent and creativity, a real boxing ring, where only the best of the best will become winners. Prepare your most successful cases and upload them on adfest.by, where more detailed information is provided. IX White Square prize winning entries will be published! on more than 30 major advertising resources of Europe and the CIS, such as adforum.com, sostav.ru, sostav.ua, gosee.de, einnews.com, bestmarketing.ee, youmark.it, adformatie.nl, marketing-news.pl, baltic-course.com, media-marketing.com, adhugger.net, luerzersarchive.com and many others. One best IX White Square entry will be awarded with a special prize of industrial media Epica White Square Award and will get the right to participate in Epica Awards 2017 free of charge! Besides, another 20! entries of White Square will obtain 100 EUR discount for participation in Epica Awards 2017 per which one (additionally, another 100 EUR for Early Birds). Enter the creative ring straight away on adfest.by, and get the victory! Just to remind you, there are 5 contests at IX White Square: creativity, branding, marketing, digital, social advertising. You Could Submit the Entries on the Official Website ADFEST.BY. Deadline is on April 7! The creative battle of IX White Square will be judged by 5 international jury casts, who are the persons with world recognition in advertising and rich experience of judging at famous international ad festivals, holders of numerous prestigious awards in this sphere, including more than 130 Cannes Lions!